Members have complained about their internet connections for the longest time. Granted, I know that there are often problems with wireless connections, so I can’t dispute their claims that this very well may be the case. Even in this day and age, with our technology-driven society, nothing is perfect. What happens when an internet connection drops? The user is sent to a screen that says something similar to this (depending on the browser they are using): “This Page Cannot Be Displayed” or they’ll be frozen on the page they are on. In a chatroom , they should see that error page or if it signs them out, and then their connection returns but if they’ve already been signed out, returns them to the main page or log in page to enter their username and password. Often, sites will return the member to the page they were on prior. What I’m seeing looks to be the result of redirecting attempts, either automatically by the site’s servers or by someone manually returning members to the page they were on prior to clicking through to the girl’s chatroom. In other words – the main listings. Here are some members, in the last month or so, who have complained about this very issue. Keep in mind that there would be plenty more, if the member didn’t get booted before he could even type to me. This is not my connection either. If it was, the video would appear black to the members, or frozen. Maybe I am being singled out, as far as members being booted from my room. What else could explain his connection dropping a lot, “especially” in my room? I’m lucky to have such persistent members. This has been happening frequently with him (only recently) and it shouldn’t. I didn’t log off until 4:30 that day. Worked straight through until then. This is a member who knows the difference between ‘offline’ and ‘in private’ or ‘exclusive’ and this certainly showed me as ‘offline’ when clearly, I was not! I was also able to back him up doing a search for that girl. Unable to find her performing a search on the site, only through her Cammodels link (exterior link), knowing the exact url to her page. These 2 on the same night, never showed as logging on (private sessions). The only way I knew they were even there was a blinking red light to indicate someone had left my paid chat area. When in guest chat, if someone goes private, the private guest chat window is supposed to appear automatically but it never did, nor did he show as having entered the room, only leaving. This is a strange and frequent occurrence. 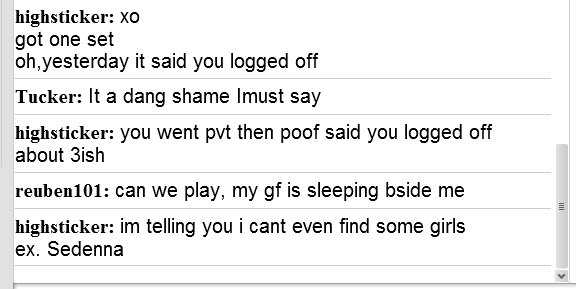 This all happened in a short span of time; one member complains that I froze, but then I returned. Not my end. Likely not his either. Another member was surprised to see how little traffic I had, as opposed to the last time he saw me. I did used to have good traffic to my room. Another member mentioned that they kept redirecting him. Straight out – redirecting. He didn’t say his connection dropped or I was frozen. No, he seemed to know exactly what was going on. This one claims I was on his favorites but am not anymore. This is not the first time I’ve heard this from a member. Keep this in mind the next time you think it might be your connection and look closely at the other factors involved. Never mind the reasons for them booting members out of certain girls’ rooms. Don’t bother asking “why would they do that?”. The explanation is a very simple one. Some girls work for less commission than others, therefore giving the site a larger share. One would never think to question this, as a member, because it only makes business sense to assume we’re on a fair playing field, but we’re not. Inquire about this with the girl. If you can’t get back into her room, Google her handle and try to find her on Twitter, Facebook, any social networking platform. It doesn’t take Scooby Doo to find us. Most of us are easy to locate. Oh and if you have a favorite, keep in contact with her outside of the site. She may, as my members have, magically vanished from your favorites list, without your knowledge. Your favorite might also have moved onto another site or is camming from her own site. Grab yourself a Scooby snack and get Googling! You’ll be glad you did.